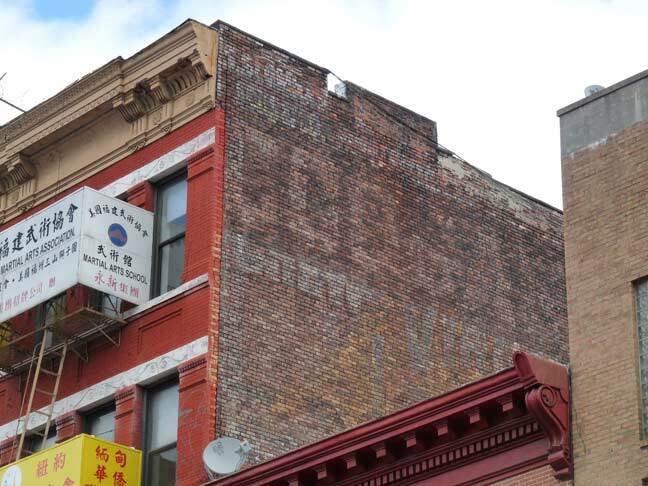 The painted word “Coogan” seen facing south on the east side of the Bowery near Grand is the exact same one that can be seen in photos of the Bowery from the late 19th and early 20th Centuries. James J. Coogan operated a dry goods and/or furniture store here between Hester and Grand; 1888 photos show this painted sign in place even then, so it has survived close to 125 years. And yes, as Manhattan Past explains, there is a connection to Coogan’s Bluff uptown near the old Polo Grounds. Connection to the ancient Clint Eastwood movie “Coogan’s Bluff”?